Discussion in 'Suspension' started by Motorkopf, Jan 2, 2008. Just had the suspension TSB done after I had already installed a Toytec 3" lift. Was worried that the dealer might have a problem doing the TSB with the spacers installed- but they had no problem whatsoever. I did the 1" block in the rear vice the add-a-leaf since I had planned on getting the TSB done. Looks great! 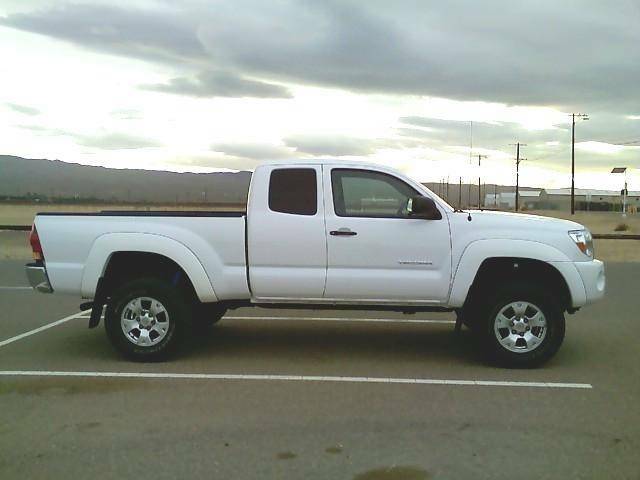 Very happy with the service at Valley Hi Toyota in Victorville. With the TSB, 3" lift in the front, and the 1" block in the rear, the rear is slightly higher than the front. I'd say it's comparable to the stock tilt but I haven't measured it. Before I did the TSB (just the 3" in the front and 1" block in the rear), the truck was level. thats great they reinstalled your lift w/tsb. im sure it looks sweet. PICSSS !! I'll try to post some. I'm really happy with it and I think the height is perfect now- wouldn't want to go any higher. Now I just need some steps and I'm thinking 32" tires when the stock tires are done. i couldnt tho, i think it would be too much $ i got my 3" lift for about $230 and did the work myself, not sure how much a 6" is but i know it's more than what i paid!! Thanks L. I'm sure I'll be satisfied for years to come with the 3" lift. I paid about the same, but honestly I don't think I would have gotten a 6" lift even if it were as cheap. I think the extreme lifts like that are both impractical and excessive, not to mention kind of obnoxious! Seems like they're "compensating" for something- not to offend anyone! hahaha i've heard that "compisation" comment from a few people. Thanks. I'm very happy with it.